Batteries are the predominant cost in the price of a cordless tool. The batteries control the tool’s runtime, and (more or less) the power that the tool outputs. There are a few main types of batteries for power tools, and each has different maintenance and usability requirements. It is important to remember though that a cordless tool is only as good as it’s battery. Voltage is the measure of the strength of an electrical source (for a given current level). Rechargeable batteries for power tools generally contain cells with a voltage of 1.2V, 1.5V or 3.6V. Manufacturers utilize these cells to produce batteries that can have a voltage of anywhere between 3.6V and 48V. Generally speaking, the higher the voltage, the heavier the battery will be, and the more power it will be able to output. Batteries that have a voltage between 3.6V and 12V are generally designed in light duty tools, such as cordless screwdrivers and small cordless drill drivers. Batteries that have a voltage between 14.4V and 36V are manufactured for use on heavier duty tools such as cordless hammer drill drivers, cordless angle grinders, and cordless circular saws. The most common voltage used amongst manufacturers (due to its weight, cost, and potential power output) is 18V. Once fully charged, the maximum runtime of a cordless tool is largely determined by the battery’s amp-hour (Ah) value. In essence, this value represents the fuel tank of the tool. The larger the fuel tank, the longer the tool will operate for. Amp-hour values will generally range from 1.3Ah to 3.3Ah, depending on the tool’s intended applications (i.e. light or heavy work). As this capacity increases, batteries will also become heavier and will take longer to charge. Theoretically speaking, a 1.5Ah battery in a device drawing a current of 1.5 Amps will last 1 hour. Unfortunately, this is not an effective way of estimating the realistic runtime of a cordless tool, as other important factors (detailed below) also come into effect. ‘Memory effect’ in some batteries can also seriously affect their runtime. This is the main reason why batteries last for very short periods of time, even right after they have been charged. The term ‘memory effect’ is a condition found in some rechargeable batteries that results in the reduction of their capacity. When a battery is discharged repeatedly to exactly the same level, and then recharged. When a battery gets old. When a battery is charged too slowly. When a battery is exposed to high temperatures. When a battery is completely discharged (batteries should be discharged until the point where the tool refuses to function adequately). The most common reason is when a battery is persistently overcharged (voltage depression). Another factor that affects runtime, but one that isn’t related to batteries, is the efficiency of the tool itself. An efficient tool will transfer nearly all of the power from the battery to the business end of the tool. An inefficient tool (generally tools of lower quality) will waste excessive power simply transferring energy to the business end of the tool, which will severely decrease the runtime of a battery. Some new batteries (or batteries that haven’t been used for a while) may take between 5 and 7 charge cycles to reach their peak run time. There are three leading battery chemistries on the market today; Nickel-Cadmium, Nickel-Metal Hydride, and Lithium-ion. Nickel-Cadmium batteries are the most common type of batteries for power tools. Their advantages and disadvantages are listed below. Nickel-Metal Hydride batteries were once believed to be the answer to all of Nickel-Cadmium’s shortfalls. For many reasons though, their popularity and availability has severely decreased. 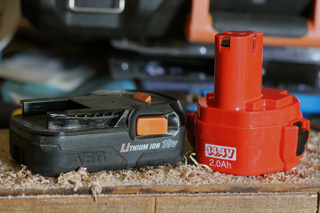 Lithium-ion batteries are the newest and most advanced type of battery for power tools. They have many advantages over both Nickel-Cadmium and Nickel-Metal Hydride, but still have their shortcomings. These shortcomings have been addressed by some manufacturers by introducing elements such as Phosphate, Manganese and Cobalt into their battery’s chemical composition. High quality brands will also feature electronic cell protection to stop the battery’s cells from overheating, and from being overloaded and over-discharged. There are only a few main suppliers of Li-ion cells that all the main power tool manufacturers use in their batteries. The best quality cells are made by Panasonic and are usually found in the more expensive power tool brands. Sony cells are good quality and are found in lots of brands’ cordless tools. Samsung cells are also recommended. Most other brands source their battery cells from obscure third-party companies. Always ensure the cordless tool’s switch is off before disconnecting the battery, and never let any metal come into contact with the battery’s terminals. If an old battery becomes redundant, please take it to one of the many waste management companies in your local area devoted to safe battery disposal. Please don’t put them straight in the bin, and never expose them to fire as they can explode. Was this guide helpful? Has anything been left out? Are there any improvements that could be made? Please take a moment of your time and click here to provide your valuable feedback. Alternatively, provide your rating below.